I have no idea how it happened, but this past week was one of those blink-and-it-is-over type of weeks. All of the sudden it was Friday morning and I was hit with the realization that I hadn't organized one single thing all week. The horror right? As far as our kitchen goes, the good news is that we have begun installing trim, toe kick and moulding! I am hoping to have a full kitchen update for y'all very soon; we definitely needed to step back and take a small break to troubleshoot a few issues that have come up as we near the end of the renovation. One problem is in regards to a major appliance/kitchen island snafu... We also have some cabinet moulding decisions to make and the Mr. and I are not seeing eye-to-eye. We appreciate you hanging in there as we work through some of those detailed decisions that we just don't feel comfortable rushing. This week when I took a look at my giant Home To-Do List, I picked something that I knew I could accomplish quickly, something that would keep me excited about the kitchen, and something that would help us out during our day-to-day routine. I decided to tackle the cabinet under the kitchen sink. Although our kitchen was far from finished, we needed to reclaim our guest room a few months back. All of our kitchen belongings that were temporarily being stored in the guest room, were brought back out to the kitchen and the boxes were unloaded in a single evening. When we came up with our initial cabinet design, I made sure to assign every last pot, pan, appliance and gadget a home. This made quickly unpacking our items fairly painless, however, nothing more was ever done. Many of the cabinets have since been in a state of chaos and waiting for that special touch, under the kitchen sink included. 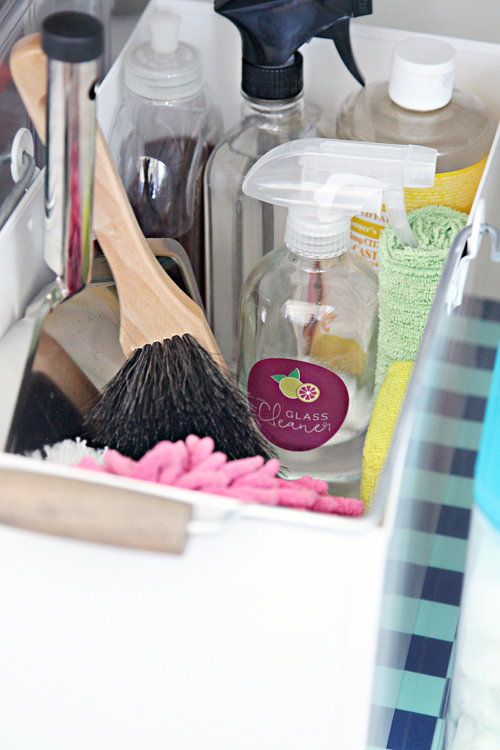 Majority of the items under the sink are things we use to clean our entire main level. There were also a few items that were brought up from our cleaning cabinet for a single use and then tossed below the sink instead of being returned to the proper home. Paper bags were acting as our recycling bin, and things were always getting lost in the back of the cabinet. It was time for a little organizing action. Step one, empty it out! But the pattern was a little busy and the lack of color left me looking for a different option. I found some gift wrap (purchased from HomeGoods) and knew it was more more fitting for my love of color happy organizing. I also knew that once things were placed back into the cabinet, that the boldness of the paper would simmer down a bit. To ensure the gift wrap would be easy-to-clean and hold up to heavy daily traffic, I covered it in clear contact paper. Read more about this process here. As I was emptying out the cabinet, I jotted down a list of everything that I needed to store, as well as the ideal way to do so. One thing I realized right away is that I wasn't taking advantage of the cabinet doors. Also, I have been wanting to find a second caddy to corral cleaning items as I have been enjoying keeping house chore supplies on both levels of our home. The entire cabinet needed to be purged down, items needed a specific home, and a few labels would be useful in keeping the entire family on the same page. I began by addressing the items we utilize daily to clean the counters and wash our dishes; we use a combination of dish cloths, scrubbers and sponges. Because these items become wet during use, they needed to be stored in a location that would allow them to dry, without damaging the interior of the cabinet. I found an acrylic spice rack at The Container Store, and thought I would give it a try. It ended up being the perfect solution because it is easy to clean and extremely light weight. 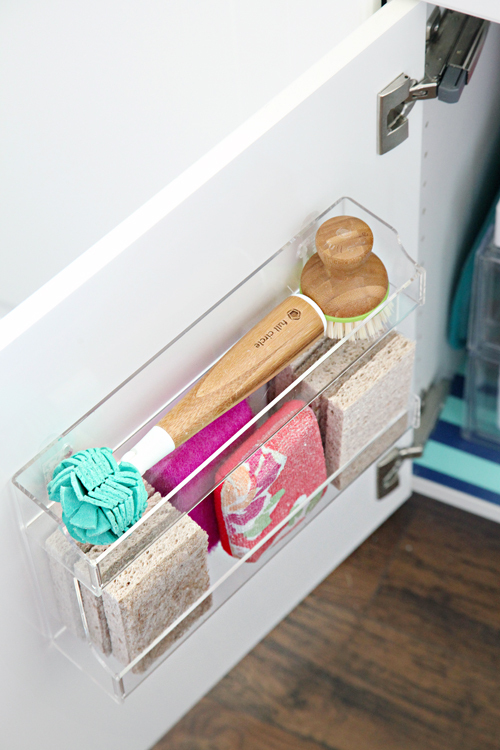 I was able to use a couple heavy duty clear Command Strips to hang the organizer on the inside of the door, and now our daily tools are always within arm's reach, yet keep the sink area clutter free (and I can think of 1,589 other places I would love to add these charming little gems). I also appreciate that the spice rack pairs beautifully with the clear stacking drawers we had used in our previous kitchen setup. I removed the jumbled mess of cleaning rags from the drawers, and washed/re-folded all of our dish cloths and towels. I also added some vinyl labels to the faces of the drawers to keep things orderly down the road. On top of the drawers I added our wet-sack to hold our dirty/damp used rags that are waiting for wash day. HomeGoods came through for me in my quest for a second caddy to corral our daily cleaning supplies. The caddy is large enough to hold a variety of items; everything from our hand sweeper and dusters to rags and cleaners. 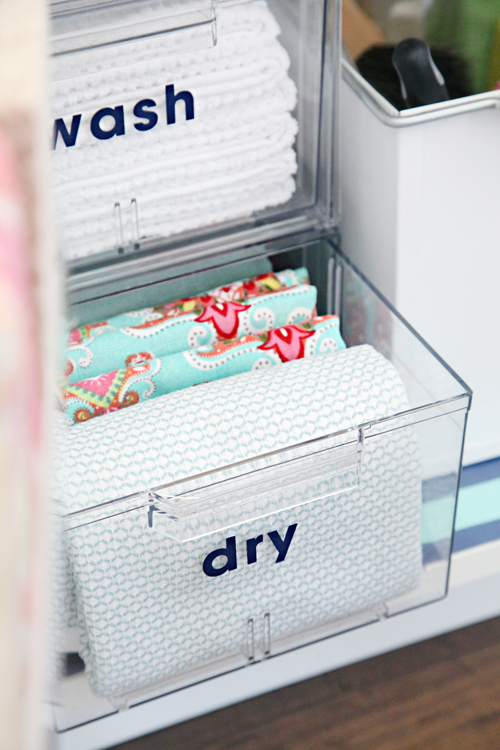 When selecting items to use for storage and organization, the number one requirement was that they had to be easy to keep clean/wipe down. I also tried to select items that would be versatile should our needs for the cabinet ever change (which I really don't see happening in this case). 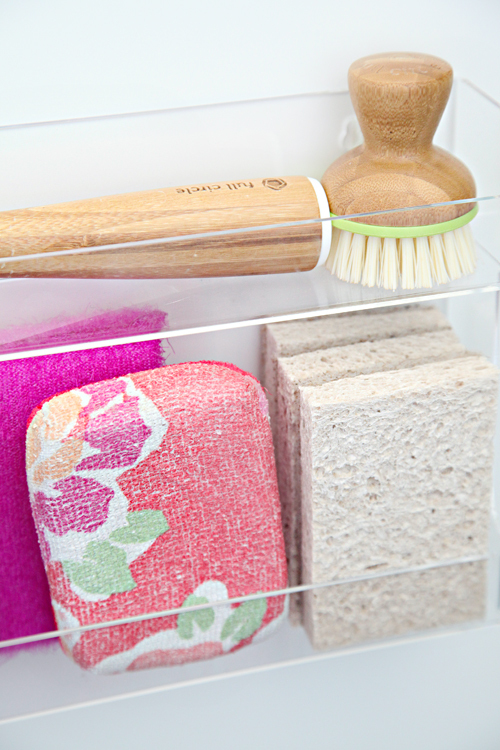 A simple clear tray holds our extra soaps for the dishwasher, sink and fruits/vegetables. Our pull-out recycle bin didn't fit in our new cabinet because the new sink is fantastically larger and deeper. I searched high and low for an alternative pull-out trash option but came up short. It is totally worth it to have the deeper sinks though, so I just stayed with a very basic bin that also received some vinyl labeling love. I put the other cabinet door to work holding our paper towel roll and dish-washing gloves. The paper towel holder is extremely light, and was also attached to the cabinet with a Command Strip. I am not ready to screw holes into our new cabinet doors just yet, not even for the sake of organization. And although I didn't end up storing our food wrap boxes inside the cabinet doors for long, I did want to re-use the dowel and hooks for my dish-washing gloves. I just wrapped the dowel in some vinyl to protect the wood from wetness. And suddenly I had myself the happiest cabinet in our kitchen! Aside from a little product sourcing/shopping, the entire project took about an hour (planning, cleaning, lining, organizing, Command hooking, labeling and admiring). Not bad for one of the busiest cabinets in the entire kitchen. I am guessing you are referring to our dish washing brushes? They are both Full Circle (http://fullcirclehome.com/shop/clean.html) and I have been a fan of the brand for quite awhile now. I typically find them at HomeGoods or Amazon. This is a lovely transformation. I love that you used wrapping paper and contact paper, such a neat idea. Thank you! I jut spent the weekend changing things around in the kitchen and I took a break for a coffee and "stumbled" across this post just as I was getting to the Under the sink cabinet! you just made my day! I like the re-cap image! Love it! Beautiful and functional! I would love to know how to do vinyl labels. ..
Ha ha, we did the same when we moved into our house nearly a YEAR ago, and I am still wondering why the dustpan lives with the dog food, and why there are spare ornaments between the coffee boxes. Luckily, this post came out just in time! My husband and I have been running wild around the house organizing and cleaning everything this weekend, but had been dreading this area! Thank you so much for posting this! So many helpful tips and that has got to be the most beautified under kitchen sink area I have ever seen!! Love it! I just got my own place and I'm definitely going to be referring to this- nothing worse than cluttered cabinets! I was just thinking that I need to reorganize the space under our kitchen sink yesterday when we ended up having a leak. I really like the ways you showed to take advantage of the cabinet doors. I never knew about wet bags. We try to use rags vs paper towel as well. I'll have to look into those! Thanks for some inspirational tips! Do you have a garbage disposal? 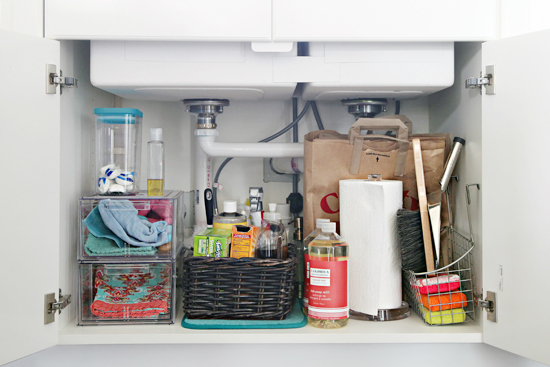 Mine is so big that organizing under the sink is so limited. We do not have a garbage disposal, however, from what I have seen I agree that they are bulky to work around. That looks so nice and organized! Can I ask where you purchased your wash and dry towels? I love the matching of all the towels . I love this post! Perfect timing! I have had most of them for years, and just collect them here and there. 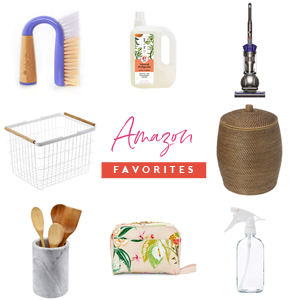 Amazon and Target are great resources for dish washing rags while I typically watch for pretty dish towels from Joss & Main, One Kings Lane and HomeGoods. It looks great! 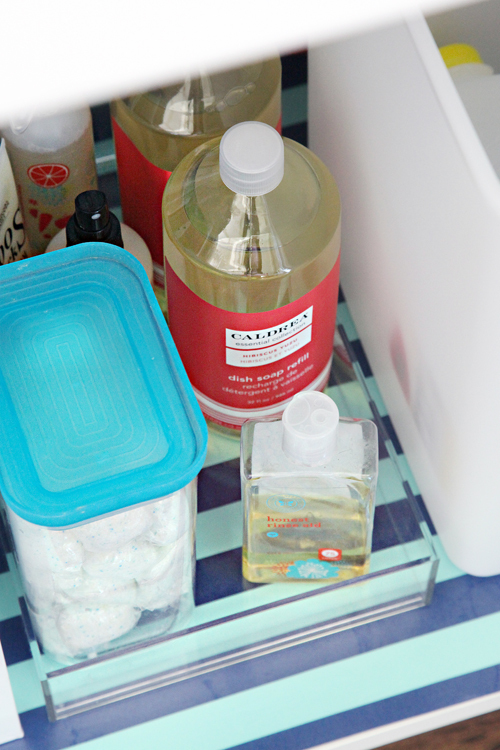 Do you decide what kind of organizing containers before you go or when you're at the store? 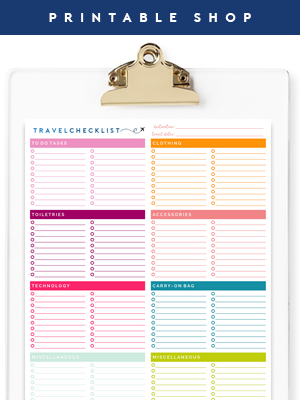 I make a list of all of the items I need to store/contain and write down a few options next to anything that I need to shop for (including specific dimensions). I usually have a few ideas in my mind when starting a project and it evolves or changes as the project goes. I never have a problem picking up a few solutions and returning the things that don't end up working out. Thanks for letting me know that process. Now I have an idea how to start my organizing project. What happened to the clips for the gloves? 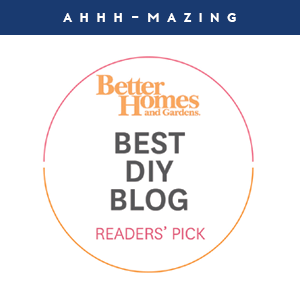 I saw that on your site and it was a game-changer for me! Love it! I need someone to do mine!! Anyone?!? You routinely amaze me with your organization skills. Thank you for sharing this information. Where do you store your extra dishwasher soap? The original container can be bulky. It looks like you used one of your favorite clear containers. Hi Holli! I typically purchase our dishwasher pods in packages small enough to fill my clear container, so that I don't have to store extra packing, but if I do, it just lands on the clear tray in the original pouch. Dishsoap refills are also stored on the clear tray. where did you get the clear container that houses the pods? thanks!! I love it! I am looking for a different place to store my washrags/ kitchen towels. This may be the spot! OMG this post is precious! 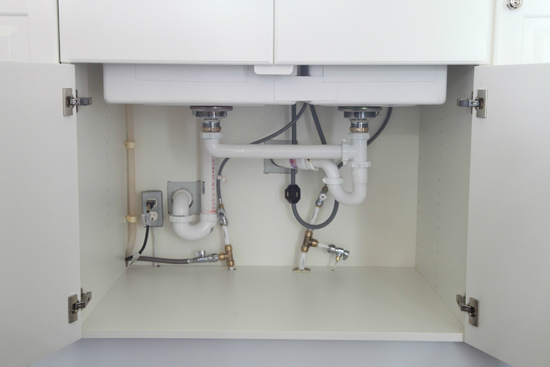 I wish my undersink can be this organized! We also tried an over-the-door basket and it worked well, but I didn't love that I could see the hooks on the opposite side of the door. 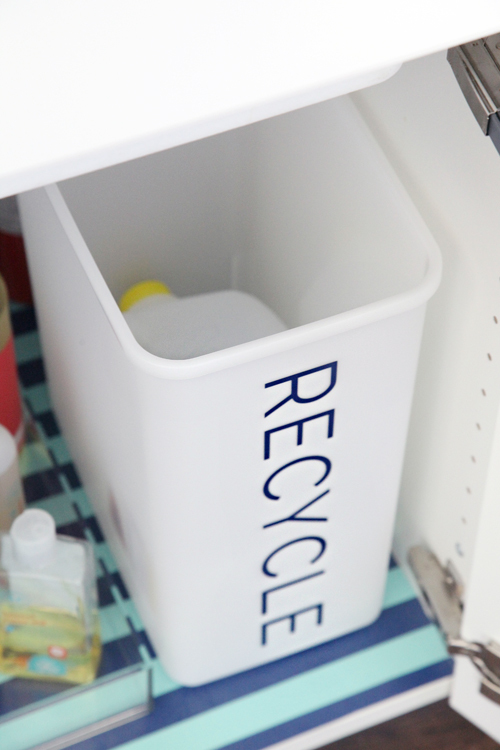 The recycling container is from Container Store. I love how you use the gift wrap. It's so ridiculously easy and simple! And yet, it makes it look better right away! 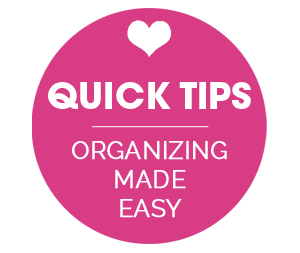 This is great and perfect timing as wellas i am currently doing my kitchen and am always looking for ways to best organize my cupboards! I am curious about your dirty rag storage. How long do they sit before wash day? How do you avoid mold and mildew on the wet or damp rags? I want to follow your lead, but this is slowing me down. Thank you. I wash mine once per week and have never had any issues with mildewing or molding inside of the wet sack. The sack seems to prevent that from happening (I have no idea if that is accurate so I can't guarantee that but I have found rags keep longer in the wet sack than when I use to toss them in an open container prior). I keep a sack under all of my sinks now for cleaning rags, and have been loving the ease for quite some time now. You don't find that they smell like stagnant water? I find if I don't wash my rags every few days, they start to get funky & even after a wash, they still stink! I will try the wet sack, since I really want to cut down on the number of paper towels I use. It's amazing how many you go through during a cleaning session. Thanks! I just use a small plastic garbage can in the laundry area. We are all on one level so this may be more difficult if you are in a larger home, but I drape the damp cloths over the edge and throw them in once they are dry. I wash with white Ts and socks weekly. Thanks for this, it's really helpful! 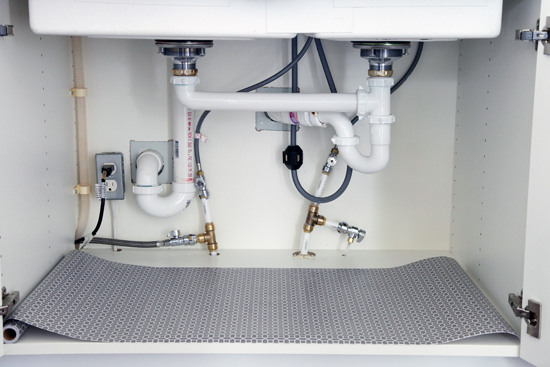 The space under the kitchen sink always gets so crowded and messy! Fantastic transformation!!! Easy to locate your supplies but classy looking! Thanks for sharing. I'm sure you've answered this before, but where did you find those pretty floral sponges? The floral sponges are from Target a year or two ago during their "back to school/college" season. I am down to my last sponge (sad face) and have been searching for more each time I go to Target in hopes they bring them back someday. Jen, thank you for this post. I came across your blog about a year ago, and I look forward every morning to checking out what you've been up. I especially love these organizational ones. They're so motivating. This space to not only beautiful but extremely functional as well. Also, where do you buy clear contact paper? you can usually find it at Target, Walmart and even small rolls at the dollar store! I'm also interested in how you make your vinyl labels. Thanks for the inspiration :) my under the kitchen sink cabinet is truly lacking. She uses the Silhouette Cameo aka a miracle worker. its a bit of an upfront cost but I have one as well and im soooo in love with mine! Odd question: If you eat meat (especially fatty meats) where and how do you dispose of the fat? We use old pickle jars and store under our sink. That is organized cabinet goodness!!! And now I'm off to purge under my kitchen sink! Very inspiring indeed. It looks wonderful. As always, I'm insanely jealous of the HomeGoods in your area. Ours is just this side of useless. May I ask why so many different options for dish cleaning, especially with a dish washer? I don't have a dw and I have never found a need for more than a scratchfree sponge but maybe I'm overlooking good ideas here!! Thanks for the inspiration, I needed it today. Hi Nicole! I agree, I am lucky with my HomeGoods stores (I have a few stores to select from which also helps). Although we have a dishwasher, I find myself washing quite a few things by hand as well. I use the sponge dish wand for glasses and water bottles, I use the smaller scrubber for pots and pans. I use sponges to keep the sink area clean and rags for any other cleaning tasks. Lucky!! Shortly we move 75 miles from target/homegoods and over 100 from ikea! Thanks for the clarification, I could use something better for water bottles for sure! I love these ideas, especially the wrapping paper with contact paper over the top! That's genius! What an amazing organization!! Thanks for sharing, loved everything that you have done for that tiny space! I just wish that few items resided under our kitchen sink! Yours looks amazing but I doubt I'd be able to reach same goal. As soon as open space exists, seems my husband feels requirement to fill it! Can't win more than few minutes. Looks great as usual. Curious if you have a spot in your kitchen where your store garbage bags. We keep the box under the sink and it takes up a lot of space. Hi Abby! We have a pull out garbage that has space behind the can to hold our garbage bags (http://4.bp.blogspot.com/-GmwXpFO5oxs/VRBjIshq68I/AAAAAAAA77Y/CVNqK0yCAEE/s1600/IHeart_Kitchen_Reno_Hardware_8.jpg). Looks great and I can't wait for a full kitchen update! Good Afternoon! We just went through some kitchen renovation and lost quite a bit of storage in upper cabinets. 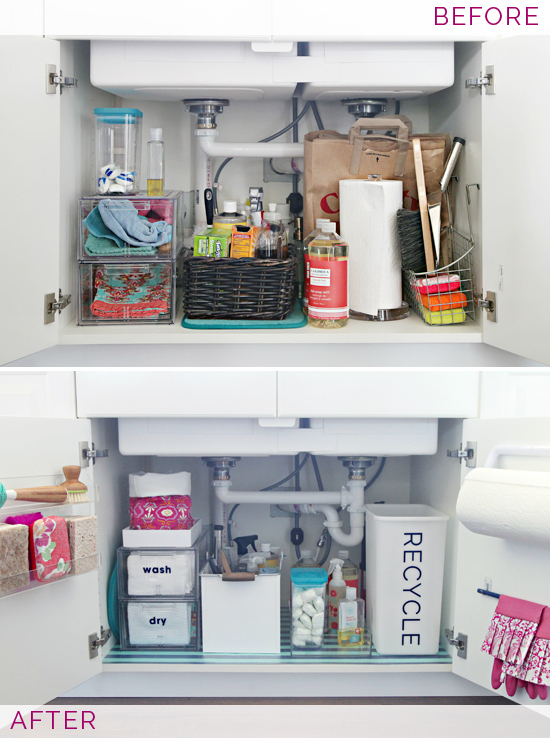 So I really love this post for ideas to take advantage of below our sink area . . . We have occasionally had drips/leaks from our water filter (installed under sink). Since I had some sort of shelf lining paper that had 'scratched' and then got wet underneath, I was looking for something super sturdy in case we ever have a leak again. We ended up using white peel/stick floor tiles we found on clearance at home depot! 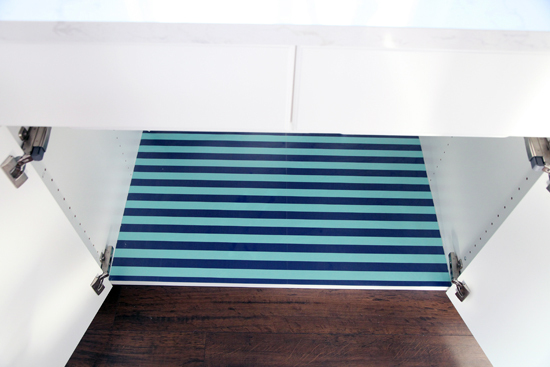 They are easy to clean and we love how easy it is to 'slide' things out from the cabinet. Just an FYI. Such a brilliant idea Cindy, thank you so much for sharing! Hi Jen! I just have a quick question about your cleaning caddy. I have looked everywhere around Target and couldn't seem to find it. Do you know another place that I can get it? I really loved this idea and i am excited to try it out! Thanks. I found the one I used for this project at HomeGoods, so I am guessing Marshalls & TJ Maxx may also have an option or two. Thank you so much for your prompt response. I love all that you do and you really inspire me a lot. Keep up with the great ideas! Love the idea of wrapping paper as shelf liner! Thank you so much!! I will try those options. Hi! So we have a corner sink and underneath the sink is just a pit, because it's a big area and it only has one door into all that space. Any tips or tricks? Is there any way that you can utilize tiered organizers or even lazy susans/turntables that can spin to make it easier to reach the items in the back/side of the cabinet? 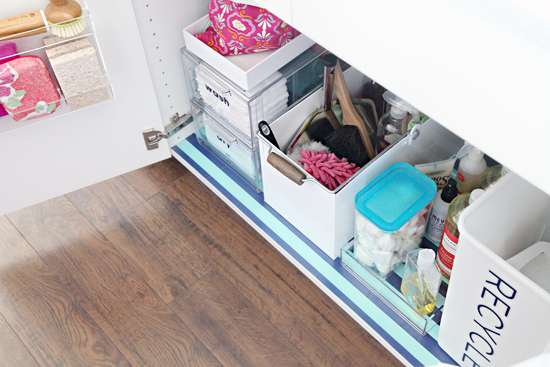 How about adding a organizers to the inside walls of the cabinet? Great ideas here! 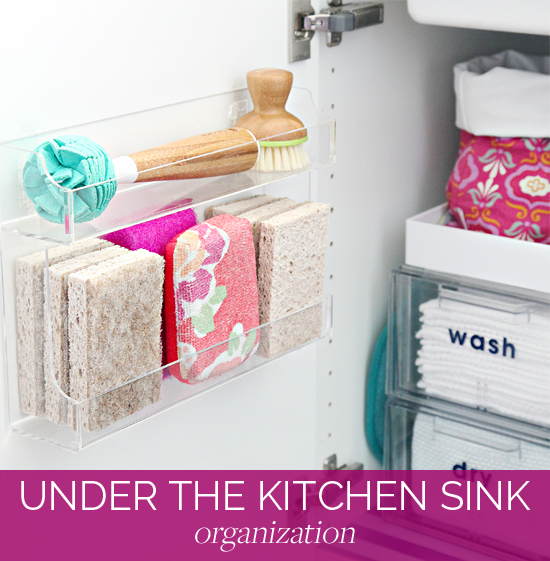 It can be hard to get stuff out from under the sink - but of course baskets can really help! I definitely will try adding that shelf liner too. Not only is it great, it looks cute too. Hi Jen! I love this post! I'm moving this weekend so I can definitely use organization ideas/inspiration like this. Quick question-where did you get the the acrylic stacking containers that have your "wash"/"dry" towels? Thanks so much! I have had them for years now and absolutely love them! I have only been reading for a few days now, but from everything I've seen I'm completely inspired! One thing I would love to know, is where do you get your labels? The recycle, wash and dry ones. I saw them in you other posts, like you dog organizing one, the dog food had a label on the bottom of the been. I'm dying to know, where did you get them? Thank you for the sweetness! Happy you found me! So disappointed you dont post as frequently as you used to and many of your posts are so generic. I am sorry to hear that and am definitely willing to discuss my posting frequency in more detail. Summers are always more challenging because I have three busy boys home all day, every day with me. I just can't/won't parent from behind a computer screen full time as they are growing so quickly and my days with them are precious. My husband works full time, contracts out on the side and also is active with the boys and their nightly sports, so the amount of time he can lend to help during the summer is also limited. I do not do sponsored content, so every post you get from me is from my heart, and driven by the things we are doing around our home when we have the time to do them. My income is also primarily provided from my Etsy shop, which takes time and requires my attention as well. I have learned in the past that forcing content just to increase my posting frequency, only causes me to waste money, reader's trust and leaves me feeling yucky. I simply can't post a new DIY project or tutorial 3-5 times per week. Thank you for the feedback. I always take every last comment to heart. Feel free to email me if you would like to elaborate in regards to your feelings about the actual content I am creating... And if you have recommendations for specific post topics you are looking for that are not generic, I am happy to listen to those as well. we are just finishing a kitchen reno so this timing is perfect! especially with the paper towel holder. But exactly which command strip can/is that sturdy? thanks so much Jen.... always beautiful!!! Thanks Riv! I believe I used one that was rated to hold up to 5 lbs. Most Command Strip packages state the weight recommendations, and if you are looking for things to hold even more, the Picture Hanging strips can take on quite a bit of weight. Just be sure to clean the surfaces with rubbing alcohol first, I found that really does make a difference. What a fantastic organization project! It turned out awesome! Thank you Jen! Ordered those acrylic containers and cannot wait for them to arrive! I thought the "Before" was already nice and better than mine. The after is really good, I should do the same. Thanks for the tips! This is such a great idea! We're redoing our kitchen cupboards, and your kitchen remodel has definitely served as an inspiration. 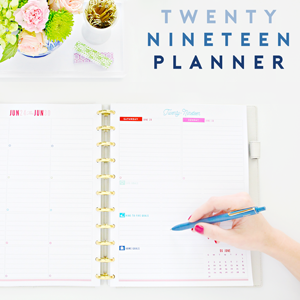 I love the light, airy look you've achieved while keeping it all organized. Cleaning the kitchen after every meal is made so much more fun and easy like this! We have a wet bucket instead of a wet bag, so i can just throw it in the dishwasher while all the rags are washing (plus it holds a little more and doesn't mildew). But I love how cute your wet bag is! Since we rent, I'm going to have to find an over the cabinet holder for the sponges, but I love the idea of keeping them clean and in view right at the door! I really enjoyed this post! Loved all the ideas in this and am definitely stealing some for my new apartment. I'm wondering where you got the dish scrubber and the sponges from? Thanks! Great post! 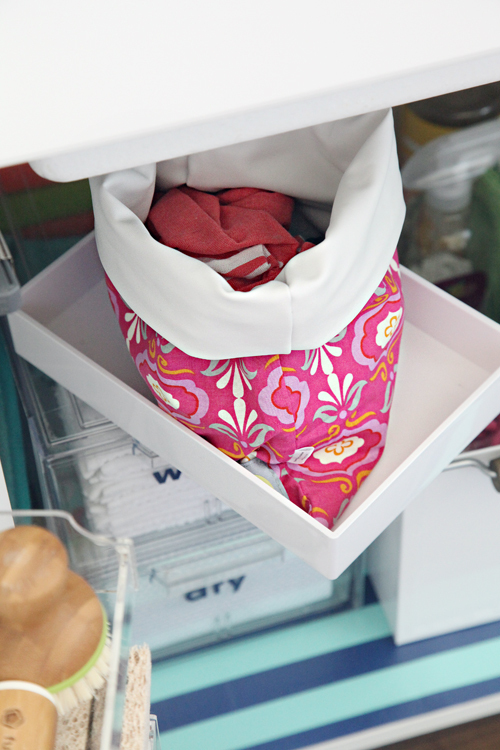 Love the idea of using a wet bag under the sink! What brand is the wet bag and what size? Thanks in advance, and keep up the great posts! We will be moving into our new home next weekend & I do not want to put screw & nail holes in my brand new cabinets. 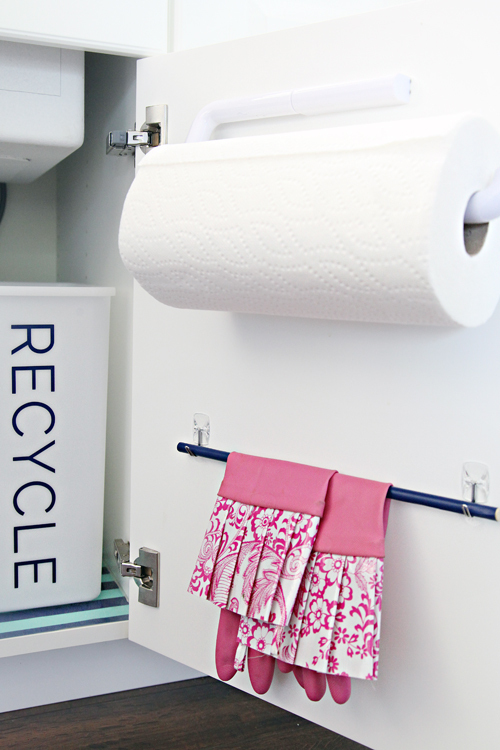 How did you hang the paper towel holder with just a command strip? Is it just the sticky strip on the holder & cabinet & not use the actual command plastic thing? Or is being held up by the entire command plastic clip in some way? The picture is not really showing how you did this. That's correct I just use the sticky portion of the Command Strip and not the actual hook (strip is affixed to both the cabinet and the back of the organizers). 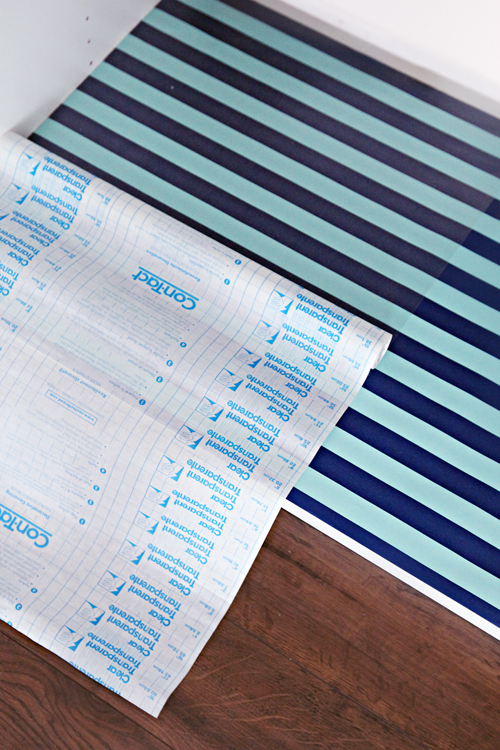 You can purchase just the strips in multi-packs, and some are able to hold more weight. Picture hanging strips are also a great option for heavier items. 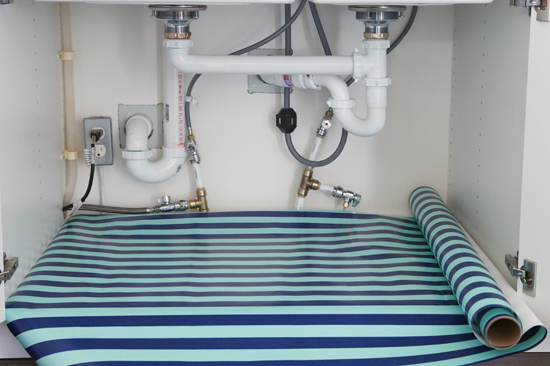 I am moving in a week and I will definitely be using your gift wrap paper idea to cover the bottom of the sink. It has a big blackish brownish spot that looks like it may have leaked in the past. This idea will definitely come in handy. I have a question about your vinyl lettering. Where did you purchase them and what size did you use? I would like to use some to label things under my sink as well. Hi Rayven! I made the lettering myself using vinyl paired with my Silhouette Die Cutting craft machine. The machine can cut a variety of materials, and all of the fonts you have loaded on your computer are compatible with the software. I wish you all of the best with your upcoming move! Where did you get that clear tray you have in this post? thanks.. I was wondering what size your acrylic drawers are. I went on the container store site and there are a few options. Thank you!! OMG!!! I love this! I was wondering which Command Hook you used for the paper towel holder? Again I love this!